Nikon has introduced a retro look to its latest DSLR, the Df u2013 a full-frame model designed to be compatible with vintage F-mount lenses dating back to 1959. The Nikon Df is a mid-to-high-end DSLR aimed at professional photographers and enthusiasts. Nikon UK product manager Hiro Sebata hailed the Df as a ‘fusion of great things past and present’ – the ‘f’ standing for fusion, and the ‘D’ denoting the camera’s DSLR status. The Df will cost £2,749.99 and will only be available as a kit with a 50mm f/1.8G AF-S Nikkor lens. This ‘special edition’ lens boasts ‘a retro look and feel to complement the Df camera body’. The magnesium-alloy-bodied camera borrows its 16.2-million-pixel FX-format CMOS imaging sensor, Multi-CAM 4800 39-point AF system and pentaprism viewfinder from the top-of-the-range Nikon D4. Weighing 710g, the Df is the lightest of the firm’s full-frame DSLRs. It has weather sealing on a par with the D800, adds Nikon. Vintage, non-AI, Nikkor manual focus lenses can be attached via the camera’s collapsible-type metering coupling lever. AI stands for ‘Automatic maximum aperture indexing’ which Nikon introduced in 1977 for coupling the lens to the camera’s exposure system. Though Ai lenses were backwards compatible with non-Ai cameras, non-Ai lenses were not compatible with all Ai cameras. Sebata explained that illumination of the focus on the viewfinder screen can be turned off in manual focus, to help the photographer concentrate on the image. The live view monitor displays a choice of three grid formats: rule-of-thirds-type; 16:9; and square format. Nikon claims that the camera offers ‘real portability; by allowing up to 1,400 shots per battery charge. 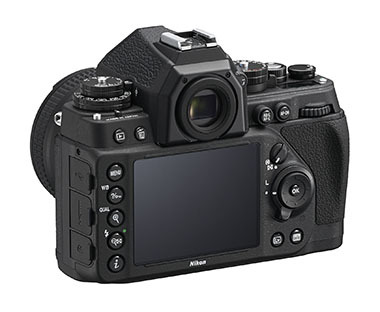 Features include an ISO extendable up to ISO 204,800 and a quiet shutter release function. Also on board is an Expeed 3 image processor, a top shutter speed of 5.5 frames per second and 3.2in (921,000-dot resolution), LCD screen. The Df will not go on sale body only, though Nikon says it will monitor customer feedback on this in due course. The body will be out in a choice of classic black or silver with black highlights. The launch coincides with the 80th anniversary of Nikkor lenses this year. ‘The textured grip, mechanical dials and flat top-panel hark back to Nikon’s iconic silver-halide film SLR cameras such as the F2 and F3…’ adds Nikon in a statement released today.